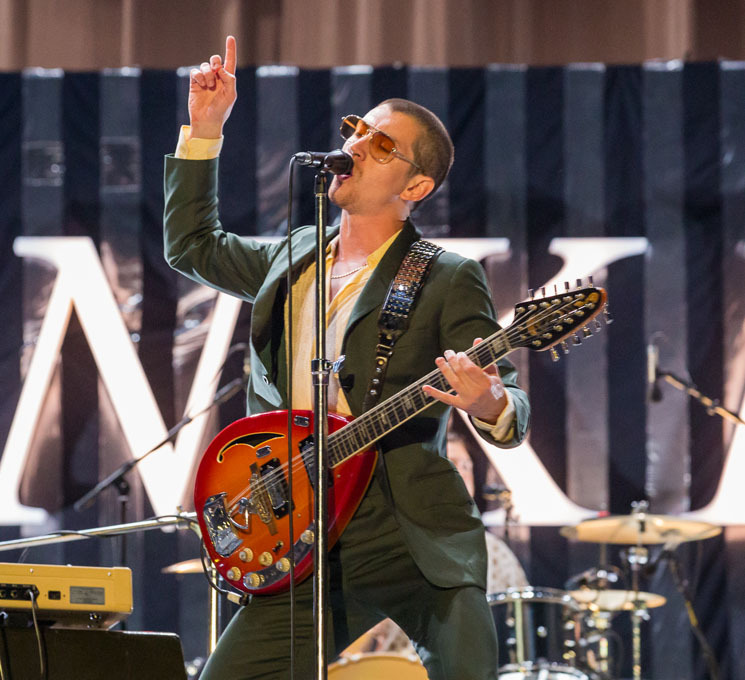 Alex Turner and company took to the stage last night fresh from a new phase of reinvention. Their latest album, Tranquility Base Hotel & Casino, is 40 minutes of cosmic lounge pop, with Turner on the piano with a Bowie-inflected voice, crooning about calling "the martini police." For their headlining set, however, they dove into their entire discography, pulling out all the hits for an eclectic and electric set. With a newly-shaved head, and donning a suit with a distinctive '70s cut, Turner and the rest of the Monkeys launched into "Four Stars Out of Five," followed shortly by "Do I Wanna Know?" off 2013's AM. Like the seasoned performers that they are, the band moved seamlessly through track after track while performing on a couple of glowing platforms, reflecting the style of their latest album cover, in front of a simple backdrop of their name flanked by slew of campy lightbulbs. Stepping back into 2007, the band threw themselves into "Brainstorm" and "Teddy Picker" Turner shaking his hips, grinding against his guitar, and letting out a little high kick during the next track, "Crying Lightning," to screams from the crowd. With a bit of sardonic banter throw in here and there, the band moved through "Why'd You Only Call Me When You're High?" and "Kneesocks"; the sold out Osheaga crowd were complete putty in their hands. Returning to their latest record with "One Point Perspective" it was clear that Turner's recent performance tactics had morphed from rock-star stance into Tom Jones-swagger; he moved about the stage like a Vegas singer rather than a UK-bred punk. Shifting gears with "Pretty Visitors", and "Arabella," and ending with an encore of "Snap Out of It" and "R U Mine?," the Arctic Monkeys left the stage, knowing that they had given the audience exactly what they desired.